What prompts someone to move halfway across the world, to work in a hospital near Fukushima Daiichi Nuclear Power Plant? I can tell you. It was first, because I didn’t know enough, and secondly, because I wanted to know more. On March 11, 2011, Japan was struck by an earthquake and tsunami, which triggered a nuclear accident. Four years later and 9,000 kilometers away, it was February 2015, I was a master’s student at the University of Edinburgh, and a guest lecture was about to begin by Japanese researchers on their work in Fukushima. I knew there had been a nuclear accident in Fukushima. I assumed this had led to dangerous radiation levels and increases in cancers. I had never entertained the thought of visiting. What happens next could be described as a clash between what I thought I knew and reality. The researchers gave a series of presentations. They showed us what they had found in Fukushima; there were overwhelmingly low levels of internal and external radiation in residents,1,2 and a mass screening of babies and children revealed that none had detectable levels of internal radiation contamination.3 Yet, other health problems were emerging; in contrast to low levels of radiation, an increased burden of diseases unrelated to radiation, such as diabetes, cardiovascular disease, hypertension and more, was being found.4,5 Particular health risks associated with evacuation were highlighted,5 including evidence that immediate evacuation of the elderly from nursing homes was associated with three times higher mortality risk that non-evacuation.6 It was presented to us that radiation may not be the biggest problem for Fukushima. I was surprised. This appeared to be, in fact, the exact opposite of what one may think about Fukushima. This surely was not the Fukushima I had heard of or visualized, and my curiosity was piqued. I talked to the researchers and proposed an idea for further research. They, in turn, invited me to come to Fukushima to write my Master’s dissertation. I agreed. In May 2015, I first arrived in Fukushima, and began research at Minamisoma Municipal General Hospital. I wrote my master’s dissertation, graduated, and then was offered a full-time job at the hospital, which is where I am today. There are a lot of things I could write about, that I have learned from Fukushima. Yet one of the most unexpected parts of this experience has been the confrontation between what I thought I knew, and the reality which I found. There were few things in front of me in Fukushima that matched my original expectations, and I was struck by the feeling that I had been unaware of so much. Yet I also realized that the inaccurate ideas I previously held were surprisingly common. This has led me to think more than ever about what it means to ‘know’ something, in terms of both myself and others. Because really, how do we know things? There’s not one answer. Well there is one good answer. The abundance of fauna and flora around the exploded Chernobyl reactor. Teaming with wildlife, reproducing at an alarming rate, evidently no lasting harm caused by radiation. Most of the shootings occurred in economically downtrodden neighborhoods. These shootings, by and large, are not a middle-class phenomenon. The divide is racial as well. Among the cases examined by The Times were 39 domestic violence shootings, and they largely involved white attackers and victims. So did many of the high-profile massacres, including a wild shootout between Texas biker gangs that left nine people dead and 18 wounded. Over all, though, nearly three-fourths of victims and suspected assailants whose race could be identified were black. I still don’t understand what ‘black’ means Is ‘Black’ a color or a concept and who gets in? but clearly they do, regardless that none are actually black but mixed race. Even the so-called black president isn’t ‘black’ but just a multi-racial multi-ethnical undefinable person in such terms. What is clear however is the prevalence for violence as a means to resolve problems in this the various ethnically/culturally diverse groups. Since those who self-identify as ‘black’ are still a minority such an over-representation of perpetrators in (violent) crimes it is clearly a problem they have to deal with themselves. And then we didn’t even touch on other non Caucasian groups who self-identify as belonging to a group rather than as Americans. The same problems are now arising in Europe, where the various immigrants, even in the third generation, don’t identify as belonging to their chosen nation but to their country once some family member originated from. All this is the result of the condescending attitude of the ‘intelligentsia’ who have this strange fascination of retaining cultural identity as a right, nay an obligation. By doing so, by enabling the schism of cultures they laid the ground stone for the present clash of cultures resulting in the atrocities taking place all over europe. This is going to get worse, as more completely adverse cultures are imported and still not properly integrated. Which brings us to Erdoğan’s latest gambit. The many Syrian refugees wanting to go on to northwestern Europe provide him with a handy mechanism to blackmail the European Union: pay me huge amounts of money (€6 billion at latest count) and permit 80 million Turks to travel visa-free to your countries, or I will dump more unwelcome Syrians, Iraqis, Afghans, Somalis, et al. on you. 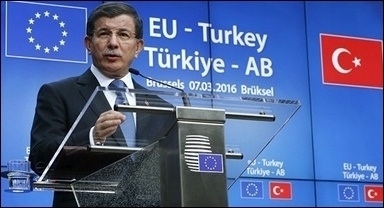 Turkish Prime Minister Ahmet Davutoğlu speaks at a conference on immigration. So far, the ploy has worked. Led by Germany’s Chancellor Angela Merkel, the Europeans are succumbing to Erdoğan’s demands. But this may well be a Pyrrhic victory, hurting Erdoğan’s long-term interests. In the first place, forcing Europeans to pretend they are not being blackmailed and to welcome Turkey with clenched teeth, creates a foul mood, further reducing, if not killing off, Turkish chances for membership. Second, Erdoğan’s game has prompted a profound and probably lasting shift in mood in Europe against accepting more immigrants from the Middle East – including Turks – as demonstrated by the poor showing of Merkel’s party in elections earlier this month. This is just the start. In combination, these errors by Erdoğan point to more crises ahead. Gökhan Bacik, a professor at Ipek University in Ankara, notes that “Turkey is facing a multifaceted catastrophe,” the scale of which “is beyond Turkey’s capacity for digestion.” If Iran is today the Middle East’s greatest danger, Turkey is tomorrow’s. Ever been to a hookah bar? Seen any dead bodies? Yesterday, a study in Public Health Reports reported that a single hookah bar session can expose you to as much as 125 times the smoke of a single cigarette. Now as a smoker may inhale somewhere between 10,000 to 40,000 micrograms (millionths of a gram) of fine particulate matter (called PM2.5) from a single cigarette, a single hookah bar session may then expose you to as much as 1.25 million to 5 million micrograms of PM2.5. Now EPA maintains that there is no safe exposure to PM2.5 and that any exposure to PM2.5 may cause death within hours of inhalation. The average concentration of PM2.5 in U.S. outdoor air is 10 micrograms per cubic meter and, based on that, the average adult might inhale roughly 200 micrograms of PM2.5 on a daily basis. While there are no examples of anyone dying from PM2.5 exposure in a hookah bar, the EPA says that outdoor air exposures to PM2.5 kill about 570,000 Americans per year — even though a evening in a hookah bar involves about 6,250 times the daily PM2.5 exposure in U.S. air. The lipophobes, however, proved to be remarkably adept at bobbing, weaving and altering their message in the face of the challenges. The American Heart Association continued to find new ways to prosper from lipophobia. In 1988 it deleted the provision in its charter prohibiting product endorsements and began offering, for a fee, to endorse any food products that met its guidelines for fat, cholesterol and sodium. In final form, the AHA campaign sold the right to use a “Heart Check” symbol and say “Meets American Heart Association food criteria for saturated fat, cholesterol and whole grains for healthy people over age two.” For this, it charged fees ranging from the US$2,500 it cost Kellogg’s for each of the more than 50 of its products that qualified (including such nutritional dazzlers as Fruity Marshmallow Krispies) to the $200,000 that Florida citrus fruit producers paid for exclusive rights to the symbol, cutting out their competitors in California. The Florida producers now ran ads saying, “Fight Heart Disease. Drink Florida Grapefruit Juice.” In 1992–93 ConAgra, the hydra-headed giant involved in practically every stage of food production, gave $3.5-million to the AHA, ostensibly to make a television program on nutrition. By the end of the 20th century, however, the AHA’s calls to reduce heart disease through diet were sounding rather threadbare. There was still no evidence that low-fat diets prevented heart disease. In 1996 the American College of Physicians came out against the AHA program of screening all people over 20 for high cholesterol. It said that it resulted in young people being put on low-fat diets that rarely reduced cholesterol. Others began pointing out that the AHA campaign to have people adopt low-fat, high-carbohydrate diets led to increased consumption of calorie-dense foods that contributed to obesity and diabetes, both of which were risk factors for cardiovascular disease. Then, in 2000, another fat panic gave lipophobia yet another boost. This time it was about trans fats, which were in the hydrogenated oils used in making everything from French fries to Doritos to granola bars. Then, in late 2008 came an apparently crushing scientific blow. A new theory claimed that the main culprit in heart disease was not fat, but inflammation. Statins were effective, it said, because they reduced levels of a protein, called high-sensitivity C-reactive protein (CRP), that contributes to inflammation in the body. The crucial risk factor for heart disease was therefore not cholesterol, but elevated CRP, which has nothing to do with fat in the diet. In July 2009 another study tried to alter this theory by reducing CRP to the role of an indicator, not a cause, of heart disease. Inflammation remained a villain, but whether it was cause or effect was unknown. With cholesterol’s role now unclear, it seemed highly unlikely that Keys’s diet-heart theory would ever be resurrected. In February 2010, the press reported on a meta-analysis of 21 lengthy studies, comprising 347,747 subjects, that concluded that there was no association between saturated fat consumption and the risk of heart disease. The evangelical drive to teach boys to be feminists reached a new high last week with the news that every 16-year-old in Sweden is to be given a free copy of the book “We Should All Be Feminists”. The short essay, based on a 2013 TED talk by the Nigerian novelist Chimamanda Ngozi Adichie, has become a sacred text for those who share Yvette Cooper’s belief that “we need our sons growing up as confident feminists”. So should we welcome the crusaders who wish to convert our male progeny to the “one true Goddess” of gender politics, or should we teach our boys to become free-thinkers who can choose for themselves whether they want to be feminist or not? I share Adiche’s belief that the world would be a happier, freer place if girls and boys didn’t face the pressure of gender expectations. That’s why I am a proud non-feminist, because one of the greatest gender expectations currently being placed on men and boys is the suffocating belief they we should all become feminists. Boys should be free to choose for themselves whether they want to say YES or NO to feminism. TORONTO – A week from now, Prime Minister Justin Trudeau and a gaggle of provincial premiers, territorial leaders and opposition politicians will fly in to the United Nations’ latest international meeting on climate change in Paris. The conference, to be attended by more than 80 world leaders and 50,000 participants, including 25,000 official delegates, will run from Nov. 30 to Dec. 11. In those 12 days, including air flights to and from Paris, this meeting, ostensibly devoted to reducing man-made global greenhouse gas (GHG) emissions linked to climate change, will generate enough GHGs to power a small African country for a year. While the UN will no doubt claim the purchase of “carbon offsets” will reduce the meeting’s massive carbon footprint, the truth is that if these people actually believed their rhetoric that the world faces an imminent, existential threat from climate change caused by GHG emissions, they would stay home and hold the meeting by videoconferencing. As it is, the example they are setting for the world is appalling in its hypocrisy — a UN meeting that is an ostentatious display of excessive consumption, whose message is we must consume less in order to save the planet and ourselves. Instead of walking the walk on reducing consumption, the UN will repeat what it has been doing for almost a quarter century on climate change, ever since its Rio de Janeiro Earth Summit in 1992. That is, holding meetings in virtually every popular tourist destination on earth, including Geneva, Kyoto, The Hague, Montreal, Bali, Copenhagen, New York, Buenos Aires, Berlin, Nairobi, Marrakech, Milan, New Delhi, Cancun, Durban, Doha, Lima, Bonn and now, Paris. In other words, doing the same thing over and over again and expecting different results, the definition of insanity. Because the UN’s approach to addressing climate change by imposing top-down, global treaties to reduce GHG emissions, has been an abject failure. Nothing that has come out of these endless UN meetings — from the international carbon credit system which is overrun by fraud and organized crime, to carbon pricing schemes like cap-and-trade and carbon taxes, to wind and solar power — has worked. The only time global GHG emissions slowed — briefly — since 1990, was in the wake of the 2008 global recession, caused by massive financial fraud by Wall Street banks in the subprime mortgage derivative scandal. That led to a global credit freeze and a world-wide recession. The reason the 2008 recession slowed emissions — as opposed to the UN holding endless meetings anywhere there are five-star hotels and three-star restaurants — is that in a recession people have less money to buy the goods and services produced using fossil fuel energy that generates GHGs. Thus, when consumption declines, so do GHG emissions. It was an accounting trick. Nothing more. The purpose of the Paris meeting is to produce a new global treaty on reducing GHG emissions to replace the Kyoto accord. Because such political heavyweights as U.S. President Barack Obama, Chinese President Xi Jinping, British Prime Minister David Cameron and Indian Prime Minister Narendra Modi will be attending, the UN will declare whatever deal comes out of it a great success that will save the planet. Then the more than 80 world leaders scheduled to attend — including Trudeau — will return home and pretend to implement whatever it is they agreed to, without actually lowering GHG emissions. Canada has been doing that ever since Jean Chretien was prime minister. Which is a good illustration of the fantasy world the UN lives in when it comes to climate change.